This week marked the 25th anniversary of the first Eurobowl. The first Eurobowl was held in 1986 from August 9 – 16 and was played in a tournament format between eight teams in the Netherlands. The Dutch Federation NAFF (established in 1984) took on the ambitious task of organizing the tournament for club teams in Europe. Under the leadership of NAFF president Guus Annokkee and Eurobowl Commissioner Roland Heerkens, tournament games were played in Zwolle, Eindhoven, the Hague and Amsterdam’s Olympic Stadium. Among the participants were club teams from seven different European countries, with Italy having the fortune to be represented by two different club teams. The Final was played between Italian Bologna Doves and Finnish TAFT Vantaa. The Finnish club, coached by Hugh Mendez, prevailed and won the first ever Eurobowl by a 20-16 final score. 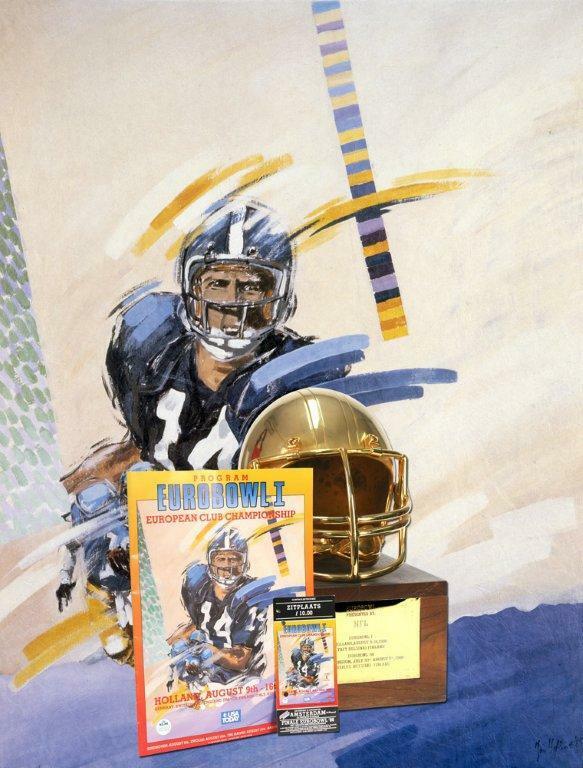 The Eurobowl trophy, a beautiful gold helmet supplied by the NFL, was featured in an article on the front page of USA Today. While the tournament itself did not draw large crowds, it was a watershed moment in development of the game both in the Netherlands and in Europe. The EFL, the forerunner of the EFAF had made its mark with its signature championship, the Eurobowl.